I was browsing the web recently when I stumbled across DOS Haven, A site devoted to home brew games made for MS-DOS machines. This is a welcome and quite unusual find as there isn’t much of a home brew scene for these machines as opposed to other platforms like the C64 or MSX which have a larger and thriving home brew community. Though not featured on DOS Haven I found today’s game from a news item there. 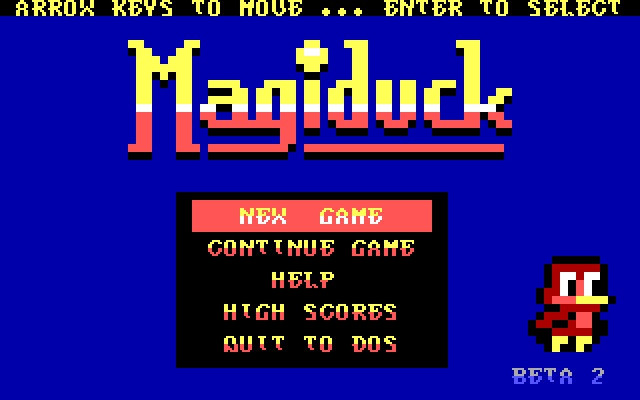 MagiDuck is an action platform game made for the IBM PC. It was made by Toni Svenstrîm with the latest beta release in 2016. It has especially low system requirements, only needing an 8088 @ 4.77 Mhz, CGA and 256K of RAM which covers pretty much almost any MS-DOS machine except those with MDA displays or small amounts of memory. The low system requirements come about partly because of the graphics mode used, which is a hacked text mode that allows for 80×50 with 16 colours similar but not the same as that used in Paku Paku. Although the graphics are quite blocky due to the low resolution, the artwork is of quite high quality. 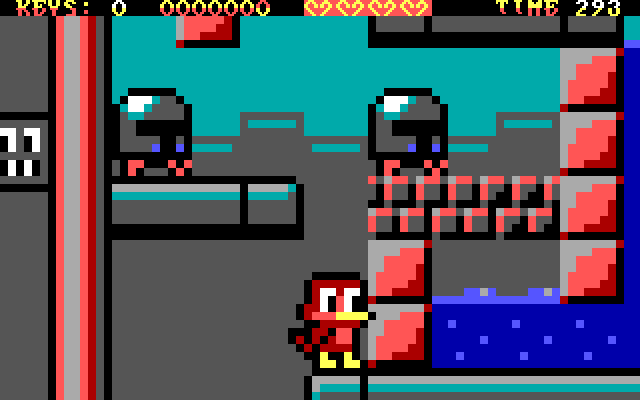 Magiduck, the enemies and the levels are all colourful and cute. On the technical side the game animates quite smoothly on even minimal hardware and even manages vertical scrolling. Because early PCs didn’t have sound cards only PC speaker is supported, and the sound is fairly good for that device. The game controls and responds quite well in a way that most PC platform games do. Although the key layout is a little different, z and x are used for jump and fire, it works just as well as the usual control and alt key layout. Magi jumps and moves as you’d expect, jumping around is fairly straight forward, which is good because the levels are quite vertical. Each level is basically a tower, you start at the bottom and work your way up to a star which represents the end. I quite like the level design, like the sprites they are colourful and fun. There is some challenge, but not so hard as to be painfully difficult. Whilst they are quite narrow (a limitation of the engine is seems) there are a number of paths of varying difficulty through each level. You can spend time collecting treasure and keys from all the paths for extra points, or speed run the game for a time bonus. Magiduck is technically very impressive and is very well designed and built. It does have some minor flaws, but generally they don’t impact getting enjoyment out of it. The hardware it can run on is very impressive, the original IBM PC was not considered capable of scrolling colourful graphics until later machines got much more powerful and the first EGA/VGA cards became common place. This game can do it on an original PC @ 4.77 Mhz and a CGA card. If you own an old machine this is certainly something you should give a try, you can find it on IndieDB here.